NovaProTM Flow can be used with any self-etch or total-etch bonding system. Pull back on the syringe after use to prevent oozing. 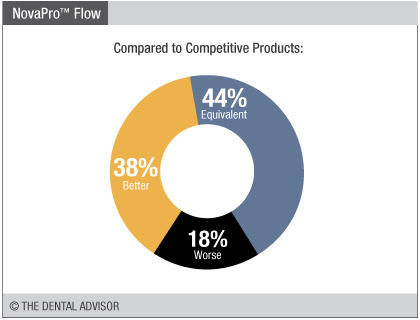 NovaProTM Flow is the first and only nanofiber-reinforced flowable composite on the market. By utilizing up to 5 % wt calcium phosphate nanofiber in conjunction with traditional silica and barium glass fillesr, the material is reinforced, similar to rebar in concrete, providing a stronger, longer lasting composite with very low shrinkage stress. 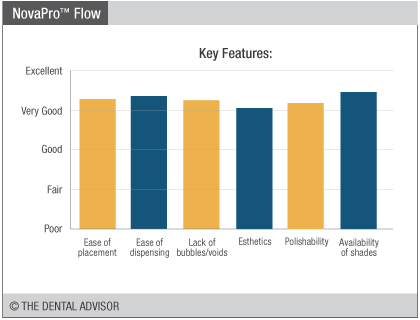 NovaProTM Flow is designed to have optimal handling and finishing properties, which does not require any special polishing tools to achieve the desired finish and esthetics expected from a flowable composite. 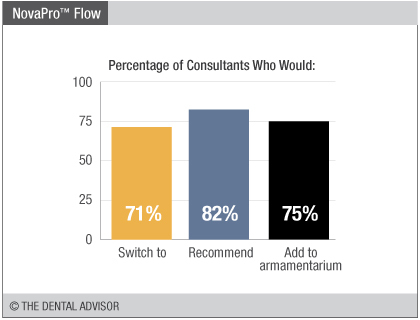 NovaProTM Flow was evaluated by 34 consultants in 1017 uses. A slight shade shift occurs during light curing, with the material gaining translucency. 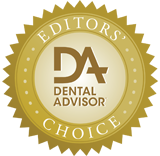 The composite has more opacity than most other flowables and blends well with enamel. NovaProTM Flow shades are lighter than the labeled Vita shades. 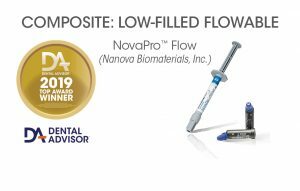 NovaProTM Flow is a low-viscosity, visible-light cured, radiopaque, nanohybrid flowable composite with Nanova’s patent pending nanofiber technology which provides superior mechanical performance and low shrinkage stress. The composite is filled approximately 60% by weight with in house made hydroxyapatite nanofiber filler and two particle fillers including 40 nanometer sized silica and 0.7 micrometer sized barium glass. NovaProTM Flow is currently available in 8 Vita shades: A1, A2, A3, A3.5, B1, B2, B3, and C1. All shades are recommended to place in 2 mm increment and be cured by a Halogen or LED light curing unit with a minimum intensity of 400 mW/cm2 in the 400-500 nm range. The minimum curing time of LED and Halogen curing units is 10 seconds and 20 seconds, respectively.